What happens behind the scenes during the trade deadline? The story of a deadline deal that changed the trajectory of a franchise. The day before we got the call, I was sitting and talking to one of our Assistant General Managers during a period of downtime. The week of the trade deadline isn’t as consistently busy for the whole front office as one might assume. It pulsates: short bursts of activity followed by long stretches of deliberation and anticipation as teams swap calls. This was one of those long stretches. We had done our preparation in the weeks before, and now it was a matter of waiting to evaluate offers and counteroffers. We were sitting in one of the offices in the Trail Blazers’ Practice Facility, a whiteboard on one wall filled with magnets showing the rosters and salaries of each team, spitballing various ideas and talking about past trades that had been made, good and bad. It was March of 2012 — the deadline had been pushed back from its normal February date because of the 2011 lockout. Though we were only a few games out of the final playoff spot, the team was in a free fall. The Vegas win totals before the season had us ranked 5th in the Western Conference, and we had started the year 7-2 with impressive wins against the Lakers and Thunder, both of whom would finish in the top 3 in the West that season. But something wasn’t right. We were 13-21 since that impressive start, and we couldn’t pull out of the nosedive. By the time the deadline rolled around, Chad Buchanan, our GM at the time, had made a decision: this season wasn’t going anywhere, and the priority was to create as much flexibility as possible for the coming offseason. We had a number of veterans who could be useful to franchises looking to improve in the near-term — players like Marcus Camby, Jamal Crawford, and Gerald Wallace — so there was no shortage of activity. We reached out to the teams that might plausibly be interested, either because they were looking for players with these skill sets or because they had asked about them in the past. One of these teams was the New Jersey Nets. 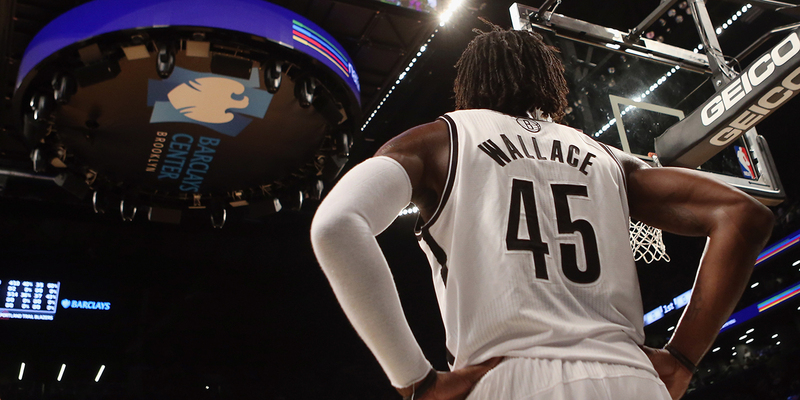 Back in December, when the lockout ended and teams rushed through a compressed offseason and training camp, the Nets had called us about Gerald Wallace. At the time it sounded like they might land Dwight Howard in a trade, a second star to pair with Deron Williams, and the Nets were looking for the right players to put around those two. New Jersey seemed willing to give up a fortune to pry Wallace from us, and so even though the talks dissolved when the Nets missed out on Howard, we knew he was high on their list. Still, we didn’t expect anything like what happened. As the deadline approached, Chad reached out to Billy King, the Nets’ GM, to see if he might still want to deal for Wallace. King said he did and that he’d talk it over with his group. When Chad got the call back, he called us into the conference room immediately. Everyone in the room looked around at each other, wide-eyed. The Nets were 15-29, the 5th worst team in the league. There were only 22 games remaining in a shortened, lockout season. This was potentially a very valuable pick. “What are they talking about for protection?” one of our executives asked. My heart hit the gas pedal. I learned very quickly after I started working for the Blazers that just because a trade is discussed doesn’t mean it’s likely to happen — there are countless ways a deal can die on the vine. But that didn’t stop the excitement. This was the exact scenario I had wished for only the day before and now, suddenly, it was real. We had the right player at the right time and were called by the right team. After some back-and-forth with New Jersey it became clear that they were not too concerned with protecting the pick outside the top three, but felt strongly about not going any lower than that. (ESPN would later report that “the Nets were willing to part with their top-3 protected pick because there are only three players in the upcoming draft the Nets covet — Kentucky’s Anthony Davis and Michael Kidd-Gilchrist, and Kansas’ Thomas Robinson.”) So that’s where the negotiation ended up. We knew the Nets needed to re-sign Deron Williams and strongly believed Wallace would help them do that, so we were aware of our leverage. But we also knew Lady Luck was smiling down on us, and weren’t going to try her patience. We would squeeze our eyes tight on lottery night and hope the Nets wouldn’t jump into that top three. They didn’t, of course. The pick landed at #6 and we used it to select Damian Lillard, who would go on to be the unanimous Rookie of the Year, a three-time All-Star in his first six seasons, and completely change the trajectory of the team. The Gerald Wallace trade was not a typical trade, and the 2012 deadline in Portland was not a typical deadline. Most teams are not in teardown mode, and most trades are not that consequential. But the trade did follow a typical pattern. The first call wasn’t made on the morning of the deadline. Interest was expressed in the week prior, and talks got more serious in the few days before. That is how most deals develop. The public doesn’t hear about them until they are completed or leak to the media, but the discussions generally start much earlier. In the week or two before the deadline teams are regularly reaching out to each other to get a sense of what everyone is trying to do and whether there’s any fodder for a deal. One GM might toss out a concept to another (“would you have interest in player X for a young player and a pick?”), and if there’s mutual interest they’ll each bring it to their respective staffs. From there the teams will discuss, flesh out offers and counteroffers, and continue to engage. Once a concrete proposal is made they’ll put it on their trade board and decide whether they want to continue further. All of that usually happens in the days before the 3 PM Eastern time Thursday deadline, not hours. And that’s because it’s difficult to take a deal from inception to completion in a short period of time. There is a lot that needs to be done. First, the teams need to deliberate amongst themselves and make sure it’s even a deal that makes sense for them. Scouts and coaches need to be consulted. Cap experts need to double check that the deal complies with CBA rules. Any last-minute digging on background, film work, and statistical analysis needs to be performed. And the key decision makers need to think it all through and follow their decision-making process. And then the negotiations have to play out. If a team is working on multiple deals at once, a GM is not always going to be immediately reachable. Teams make offers and counteroffers and have to determine when they’ve hit an acceptable deal and when they want to keep pushing. Until a deal is taken to ownership and agreed to verbally by both sides, it can’t really be counted on. Even if a team decides to grab one of their existing offers, they have to be careful because not everything on their board is solid — deals can vaporize in an instant. A team might call another back with the intent to accept an offer, only to hear that the other team has moved on. If a deal gets ownership approval from both sides, the teams call it into the league. An approved representative from each team needs to confirm the terms of the deal with someone from the league office before 3 PM for the deal to count as being done before the deadline. The deal is not completely final — there is still an official trade call that happens later, usually after the deadline has passed, and the players will all have to pass their physicals in the coming days — but at that point the front office’s pre-deadline work is done. Getting through all of these steps takes a lot of time, so teams start early. But even if the process is started earlier, the deadline still has real teeth. Teams have to properly balance the temptation to hold out for better options with the certainty of taking a deal they have on their board. The deadline is a tight-rope walk without a safety net. That is the fun, and the challenge, of the trade deadline. Strategy, negotiation, difficult decisions, a dash of cunning — all with a ticking clock. Most deadlines are not like 2012 in Portland. Most deals don’t net you a top pick in the upcoming draft in exchange for an expiring contract. Most Februaries the phone doesn’t ring with an offer that seems too good to be true. But sometimes it does. Sometimes the work done right before the deadline pays off in an enormous way. And when it does, it can alter the future of a franchise. Coming tomorrow: Everything you wanted to know about the trade deadline (but never had anyone to ask). I’ll answer subscriber questions about the inside, behind-the-scenes process that goes into the deadline. There’s still time to submit your questions! Anything this article touched on that you want more detail on? Anything it didn’t address? Drop your question here. An official Cleaning the Glass Discussion thread on the deadline. I’ll weigh in with quick takes on any important rumors or transactions, and would love to hear everyone’s thoughts as we discuss and debate the moves that are made (or not made). In the days following the deadline, I’ll write up more detailed thoughts on some of the moves that are made from a front office strategy perspective. If you missed my articles on the Blake Griffin trade and the Nikola Mirotic trade (written when it seemed like the trade might not happen), check those articles out for an idea of the angle I will write from. Either way, enjoy the deadline! For NBA fans, there’s not much like the thrill of scanning Twitter for breaking news as the clock ticks toward 3 PM Eastern. I’m looking forward to enjoying it with you.